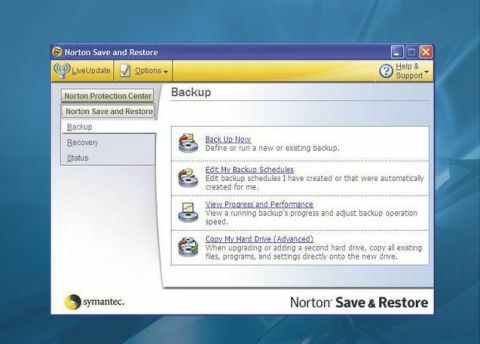 Norton Save & Restore is a backup and recovery package that includes drive imaging functionality and a recovery environment on a bootable disc. It aims to provide a complete solution for backing up your data and restoring your whole drive, even in the event that your OS won't load. Creating a package like this is a sensible aim, because it's something that enables even a novice user to enjoy the reassurance of having a full backup of their system that can be restored even after a serious crash. Save & Restore uses the successful Norton Ghost technology to create a drive image that can be updated incrementally. In addition, backups of individual files or folders can be created in the same way as any other back-up utility. If your PC crashes completely such that Windows won't even load, you can boot from the installation CD to load the Symantec Recovery Environment and restore from the drive image. That's highly preferable to reinstalling your OS should things go wrong. Save & Restore uses a simple interface that launches wizards to accomplish tasks. It's a well organised system - everything is just where you would expect it to be. On first use you create an image of your drive, ideally placing that on another hard disk. You can opt to update the image manually or schedule it to happen automatically. Separately from this, you can choose certain folders to make into a normal back-up file. There are some handy features such as the ability to specify a certain file type to be backed up. Save & Restore will locate all files of that type on the drive and add them to the backup. The backup can also be encrypted. There are plenty of scheduling options - backups can be created more than once a day if desired, and also in response to particular events such as a certain user logging on or if new software is installed. Save & Restore does exhibit some quirks that we weren't so keen on. For example, it installs the Norton Protection Center console, which enables you to manage all of your Norton security products from one interface. That's fine if your PC is fully kitted out with Norton AntiVirus, Firewall and the like, but most people use applications from a mixture of vendors. The console doesn't recognise any products other than the Norton variety, and declares your PC to be dangerously unprotected even though there's adequate AV up and running. The suggestion of how to fix your system, which apparently needs 'urgent attention', consists of a referral to a product page on the Symantec Web site. This is just annoying. There's worse to come. Save & Restore claims to be able to back up to CD or DVD, but we were told this wasn't possible when we attempted it. A drive image was created on an external drive with no problems, and it was possible to browse through the image and select the precise files we wanted to recover. The backup we made of some individual folders was less successful. A back-up file was created without problems, but we were unable to restore files from it.